As an apartment dweller in a major city that's seriously lacking on space, I consider myself lucky to have a sunny, albeit pretty tiny, backyard. It's pretty much where we spend all of our time in the warmer months. There's a patch of grass that's perfect for throwing down a blanket and wasting away a Summer afternoon laying in the sun. There's a little stone patio with a big wooden table where we eat almost all of our meals and host bar-b-ques every chance we get. And, as of a few weeks ago, there's a new big raised bed vegetable garden tucked away in the back corner of the yard! 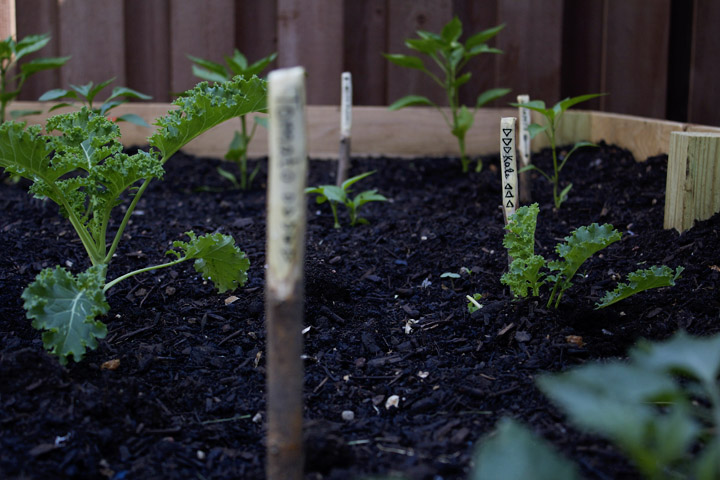 Raised bed gardens are a such a great alternative to traditional ground gardening for a number of reasons (read more about them here), but we chose to go this route to maximize space and to avoid planting our vegetables in Chicago's unpredictable natural soil. It took us an afternoon to build the bed (check out this video for a simple how to), fill it with soil and compost, and plant our veggies. We planted tomatoes, kale, spinach, and all sorts of peppers. This is my first year growing vegetables and I'm super proud of this little garden. 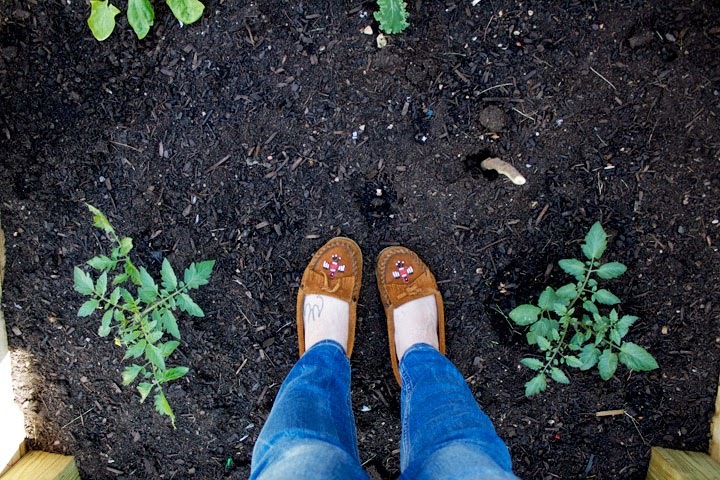 I love checking in on our plants every morning and am already plotting and planning the dishes I'll make when the veggies are ready to harvest! 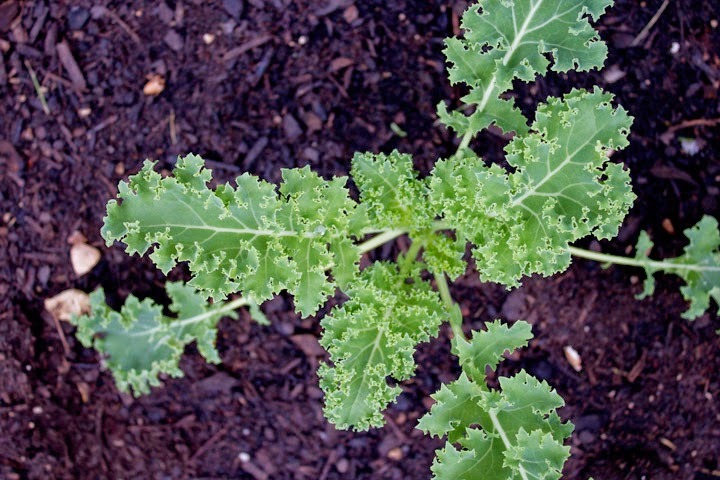 Use a vegetable peeler to remove bark from the branch just as if you were peeling a carrot. Peel away enough bark to create a flat surface to write on (I was having a hard time getting the surface smooth with just the vegetable peeler, so I went over the branch a couple of times with fine grain sand paper). 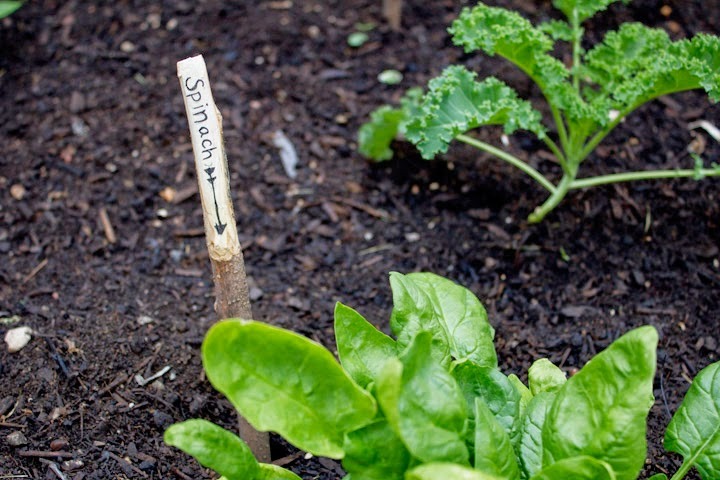 Label each branch with a permanent marker and place accordingly in your garden! 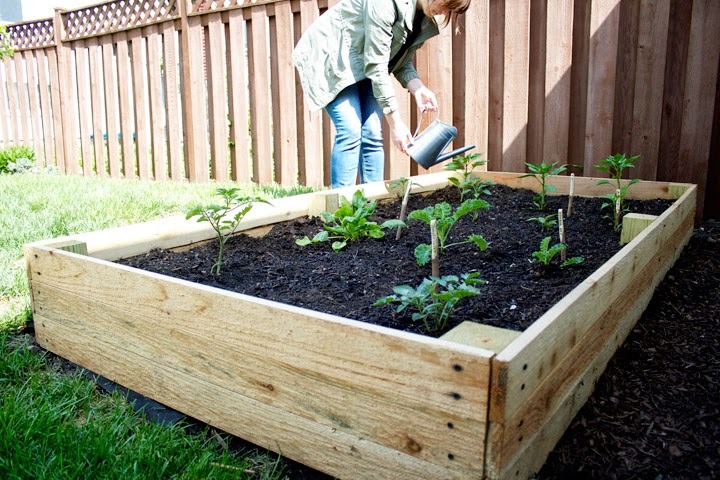 Your raised bed looks fantastic!! My landlord has promised to build us a couple of them, hopefully soon because I have a few tomato and pepper seedlings waiting around to get planted. 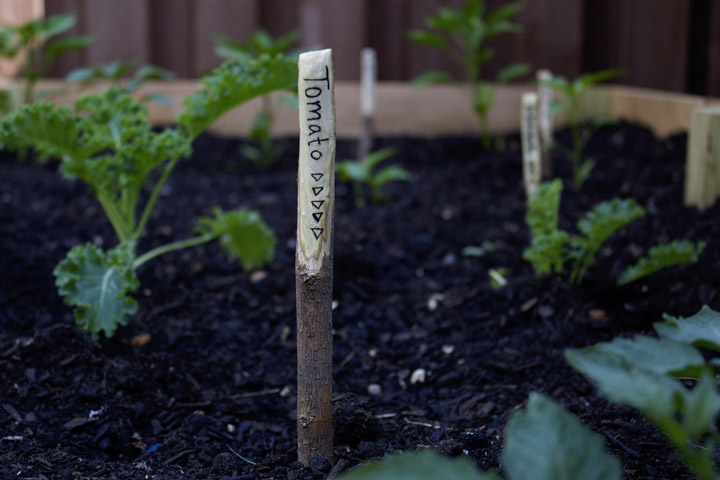 I absolutely love your garden markers. So cute!! 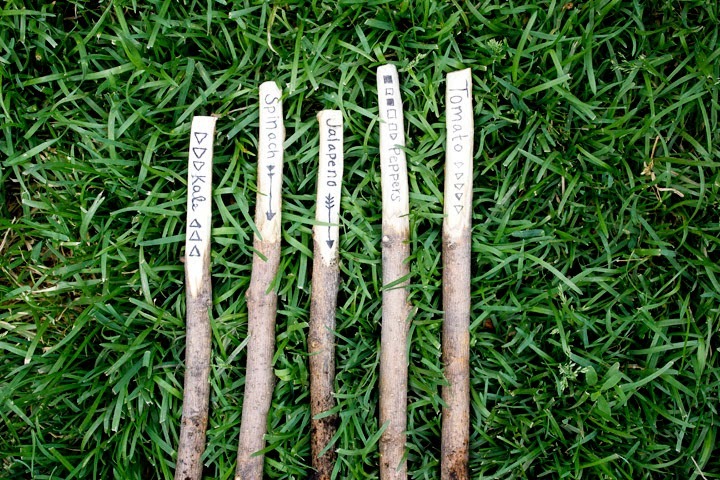 It's almost silly just how easy the plant markers are to make. 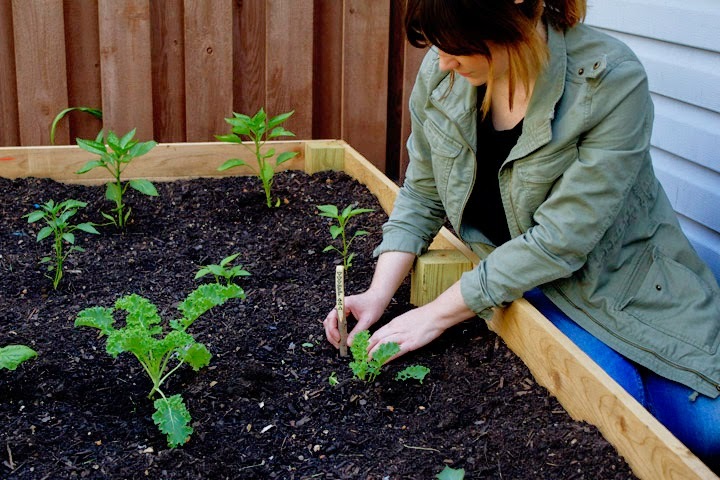 They make the perfect weekend project! 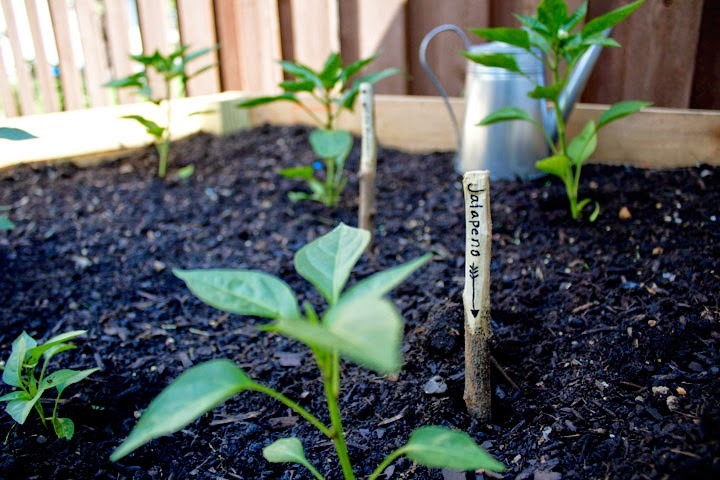 I'm hoping to have my own garden next year and I absolutely love the idea of these markers! Thanks for sharing!